Yes, I go along with the Uranus observation. Also, I think the article could do with some closer proof reading, particularly the last two major paragraphs where the language is somewhat obscure. But an interesting article nonetheless, I always find it hard to work out how the sun must appear in the skies of these planets. I take it it doesn’t rise and immediately set as it does on mercury, which I think is more to do with the orbital excentricity. As for future human colonies, if it ever was possible and they were in floating cities, surely they could arrange to move through the atmosphere so that they would experience a more normal cycle of daylight. -> Assuming the engineering/technology to facilitate the construction of such a city, my W.A.G. would be to stabilize the structure by making it at least somewhat aerodynamic, point it “nose” into the upper level winds, and then apply a small amount of thrust. This would have the end result of the colony “flying backwards” around the planet at a speed a bit slower than the upper level jets, which would (I’m speculating) speed up the day/night cycle of the inhabitants to around a week in length. –> In the right places on Mercury one would see the sun rise, reverse course & “set,” then rise again before heading across the sky to set, then “rise,” then set again for good until the next diurnal cycle. Other locations would see the Sun rise, cross the local zenith, stop & reverse course back across the top of its arc, then stop again and resume its original path toward the horizon. All of this is thanks to the combined motion of Mercury’s speedy (& eccentric!) orbit and its slow prograde rotation (tidally synched to a 3:2 spin-orbit ratio). Fact-based mental images which give birth to science fiction’s wildest dreams = why I love astronomy. 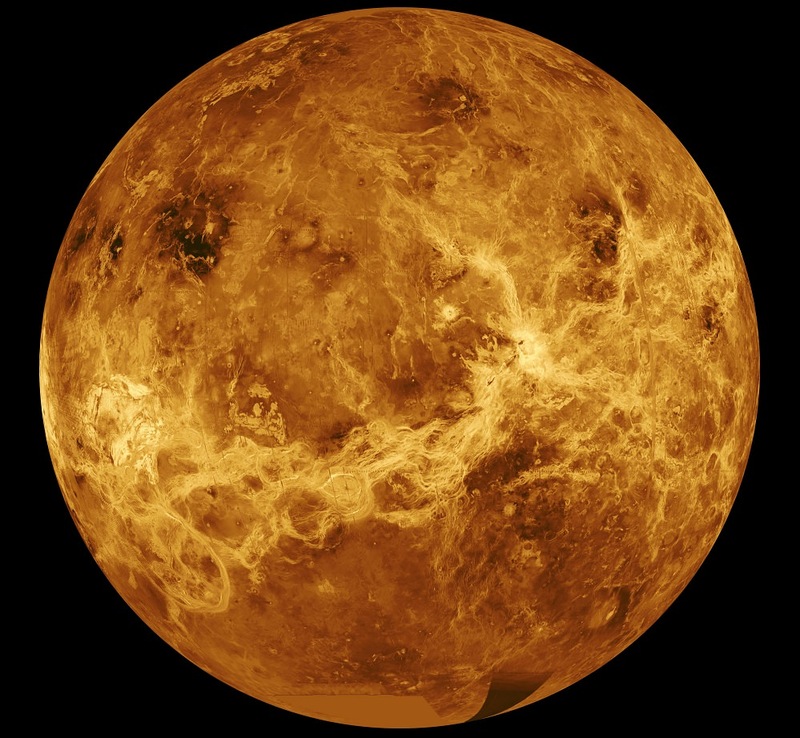 Venus does not have a ‘retrograde’ orbit. It rotates in the same direction as the other planets, so the stars will pass across its sky in the same direction. It just has a long day when compared to its year. On Earth, we have one less solar day than siderial day in a year because the sun does not stay fixed in our sky with respect to the stars; but this motion is slow compared to our planet’s rotation, so the sun only moves slowly with respect to the stars. Venus rotates slowly, so in its sky the sun goes the opposite direction to the stars. It is a bit weird to call Uranus ‘retrograde’. I remember its rotational axis is whacked over at 98 degrees, so it is more ‘sideways’ than asything else. Yes it does. Its rotational period is -243.025 days, which its rotation because it’s retrograde. And Uranus does rotate on its side, but it rotates clockwise, rather than counter-clockwise. So retrograde applies here too. We used to be able to click on a pic and enlarge it so as to be able to read what is written there. In the pic “Earth and Venus’ orbit compared”, it won’t let me enlarge it to be able to read what it says. Why is that? This article and others would be more enjoyable if I could read the information provided. Maybe a way to cool down Venus would be to direct some comets (water ice ones) into it and later, set a controllable screen to shade it from the sun, perhaps reducing the sun’s light hitting Venus by 95% until it cools down and after it does, allowing it to oscillate just to warm it up a bit over freezing water. One way to shade it would be to have some plants (somehow) floating on the upper atmosphere. And of course, it is a couple thousand year project to be fully implemented. Perhaps, by then we could spin it up a bit too. Perhaps a ~70% effective solar shade with station-keeping ability, floating in the Sol-Venus L1 position (between the Sun & the planet)? Such a shade is probably an easier engineering feat than diverting all of those comets or building floating habitats, and certainly it could be done a lot more quickly… assuming any of it is doable at all, of course. 😀 I like where your head’s at though. I read that almost all water on Venus is gone, thus, maybe the best way to wet it up would be to send some comets on it, even, if possible, slowing it down to avoid more heat. About the plants I was thinking about engineering some that would stay afloat by themselves, it would be more like seeding the clouds, perhaps a plant with taste for suffer gases. Yet the south polar vortex seems to rotate every 44 hours. I find Venus very disturbing. Our closest neighbor would have to be so difficult. Provocation! Perhaps in the future we will find out that it would be easier to re-engineer ourselves to survive those environments than change the environment. Previous PostPrevious What Does the Universe Do When We’re Not Looking?